KoopaTV: You Could've Written Real Switch Reviews On Nintendo's Website! You Could've Written Real Switch Reviews On Nintendo's Website! By LUDWIG VON KOOPA - As opposed to those fake ones from the eShop. But... not anymore. Once upon a time, being a couple of days ago, Nintendo opened up a reviews section for all of the released Nintendo Switch games available on Nintendo.com. The only other reviews that have existed for Nintendo are those stupid 3DS eShop reviews where you give a rating out of five and then say if it's for core gamers or everyone, and if the gameplay is casual or intense. Quite useless, and core + intense and everyone + casual tend to strongly correlate, so consider those one metric. ...Oh, and the written reviews back on the Nintendo NSider Forums, which were sometimes featured if written by Nintendo's hand-picked group of Sages. A five-star rating, a variety of tags, and then actual COMMENTS! 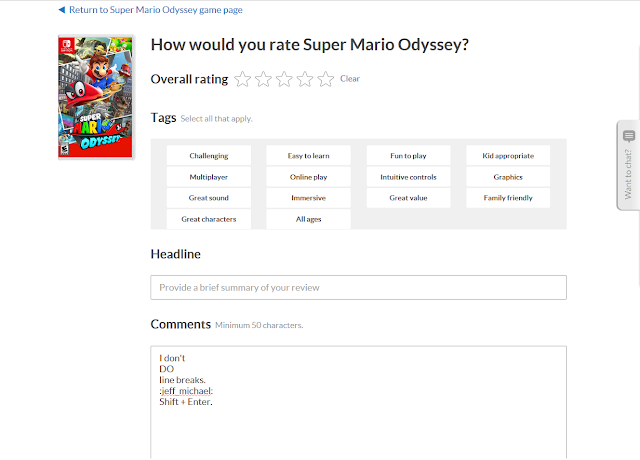 It isn't an unstructured review like you might find on KoopaTV if you look in the reviews section (you're very unlikely to just accidentally come across a review here because they are quite rare), but the presence of a headline and comments gets it a lot closer to the forum post review format that was on NSider that is, quite frankly, a lot more useful. And now they have removed them. Why? Well... blame KoopaTV staffer Rawk. Here is a visual excerpt of the review. While trying to decide whether ARMS or Sonic Mania was the worst game of 2017 (among software that people besides the developers knew existed, anyway), Sonic Mania came very close to winning out -- and nevertheless earned its title as one of most unpleasant games I've ever experienced. I'm saying this as someone who actually liked the 2D sections of Unleashed and Generations, and as someone who thought that a brand new Sonic as anticipated as Mania would pay tribute to Genesis Sonic but without intensifying all of its original problems. - The game is supposed to be accessible with its one-button setup, but say that to the Tails flying maneuver in which I get both Tails and Sonic into the air maybe 30% of the time. Not to mention I think I'm cheating by using it anyway and that the developer just didn't care. - The game is unconcerned with wasting the player's time when it comes to the trial-and-error bosses that send you back 15 minutes if you're so unlucky as to try and figure them out yourself and not watch walkthrough videos beforehand. This is apparently the only point that fans of the game will agree with me on, but is viewed as yet another charming "throwback" regardless. - The player has no idea what incoming assets they're allowed to collide or interact with until maybe the tenth playthrough. This is most noticeable in Oil Ocean Zone, but again, I'm sure the nostalgists all like it. - Knuckles is one of the most horribly-controlled characters I've ever played as and I honestly think I might be missing something here. Is the jarring stun you suffer upon glide-landing just to keep the player from ever using it when they shouldn't (which for whatever reason doesn't apply to Tails)? It felt like Knuckles had just jumped from New Donk City Hall every time he hit the ground. Sonic Mania's sole redeeming quality is its soundtrack, which features some of the best video game music ever and largely contributed to my buying of the game in the first place. That's *literally* the only thing Mania does right, however. All in all it's one of the worst games I've ever played, and possibly the single worst I've ever bought aside from that $3 penguin surfing game from the 3DS eShop and Wii U's The Letter. Oh well. Is it not odd that Nintendo apparently did not anticipate the kinds of reviews they would get? I mean, everything was to be expected. And, like the eShop, most games WERE rated between 4 and 5 stars and people were generally very positive about everything, even ARMS. And I was really considering borrowing or renting ARMS just to play it for two hours and then give it a 1-star review. Some amount of thought had to go through Nintendo's employees before creating a whole review interface and section. They would have to evaluate its business impact. Surely, they had an idea about the review content already in mind. But Rawk's review was just so... bizarre and outside-the-box that they didn't think about the possibility that someone could use the space to soapbox about anything, even other games like ARMS, so they took down the whole review feature to re-evaluate it. Only was there for a couple of days, too. While Nintendo apparently can't decide on whether or not to give you the space to rant about a videogame of your choice, KoopaTV has decided for years to give you that ability. It's called a Guest Post, and if you are willing to write something at least somewhat coherent and in KoopaTV's formatting, then KoopaTV is willing to publish it. Think about it. You will also get a lot of points in the KoopaTV Loyalty Rewards Program, which will begin anew on March 1. Seems a bit hubristic to me to assume that the evaluation was entirely Rawk's doing. I'd more speculate that plenty of people were trying to abuse the review system with inappropriate language and talking about things that have nothing to do with reviewing a game, something like that. All of the reviews that did get published, and there were hundreds of them, were just fine. Obviously Nintendo should know ahead of time what they'd be getting into by allowing comments on their site. Most bad behaviour is very predictable. I'm not saying he didn't add to the pile. But to just say to blame him, I mean, it just seems like ragging on him a bit much there. If you're concerned for Rawk's feelings, know that it was him who went into this article and contributed the second and third screenshots, as well as the whole text of his review. If you could get platinum coins on My Nintendo for leaving a detailed review, then maybe I would consider it. Then again maybe I wouldn't considering most of the rewards are useless anyway. ...Platinum Coins don't affect anyone's behaviour. They're as scarce as sand. Haven't you considered that, instead of blaming it on Rawk, Nintendo could've removed the review system to something that's NOT a numerical system? ...Nah, because everything was rated between 4 and 5 stars anyway. That's wot Nintendo wanted. It's the text that would be the problem. That's Rawk's fault.